It is a given that your restaurant's financial infrastructure is how your business stays a float but simply calculating your net income on the fly with little direction is going to distract you from setting future financial goals for your restaurant to reach. For short-term financial goals, look to set small daily, weekly, and monthly goals when it comes to gross profit. It may seem obvious to seasoned managers, especially those who manage a franchise or a restaurant chain, but setting sales goals is a huge motivator to take steps towards financial growth. Make a positive impact on your bottom line with this ultimate menu design guide. Mirroring short-term goals, long-term goals can be created to set sales goals on a quarterly and a yearly basis. These sales goals can be set up as chunks of your fiscal year and your entire fiscal year to create set a sales standard to reach and stretch financial goals to pursue. However, it is important to not overextend when it comes to long-term goals. A goal that is several years a head can be hard to track and may change too frequently from when it was first initialized, and should be avoided. Finances are the back bone of your restaurant so, do not get tunnel vision focussing on simply sales, sales, and sales. Other aspects such as reducing unnecessary expenses, limiting liabilities and increasing assets are various other financial goals to help your restaurant grow. Setting up short-term financial goals that are attainable have a massive impact on your restaurant's ability to reach long term goals that you and your managers strive to achieve. The promotion of your restaurant is a necessity if your hopes of growing are to come to fruition. There are several avenues when it comes to advertising, however, they can often be quite expensive and confusing to grasp. So, there is nothing wrong with taking your time. Setting short-term goals for your restaurant's marketing can be as simple as running small short ad campaigns through local media sources for a few short weeks, being active on social media and review sites, such as Yelp. Small marketing nudges like these can help give your restaurant a small taste if they are avenues you want to pursue more aggressively. Setting small goal windows helps your restaurant ease into marketing with huge advertisement pushes. Long-term goals can be seen as extensions of the examples above. Creating more elaborate marketing strategies and campaigns are always being crafted by businesses and your restaurant is no different. Creating larger windows for your advertising goals give you more time for your strategies to build momentum as well as generate more data to be tested. Setting up advertising goals quarter to quarter are great in grading the overall ROI for your restaurant's advertising efforts. 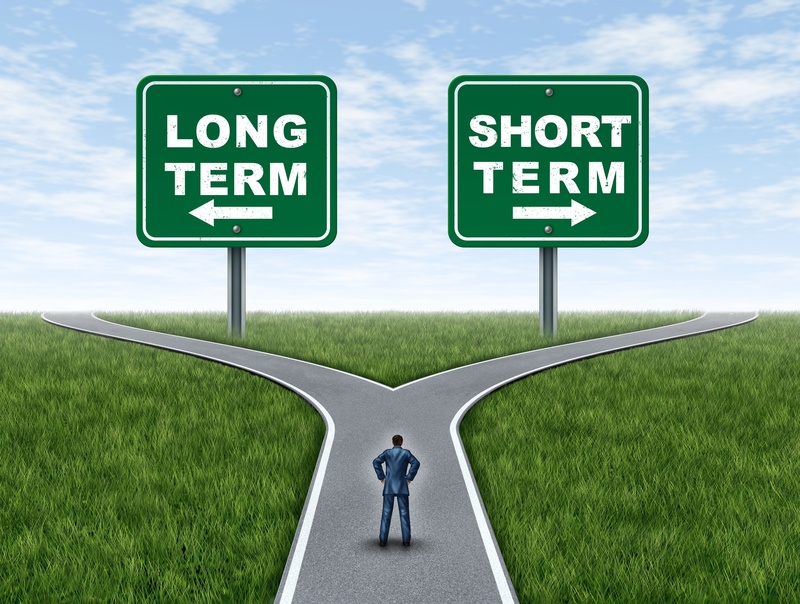 Incorporating short and long-term marketing goals will not hurt your restaurant. Having short term goals will help with the direction and formation of your long-term goals without having your restaurant shooting for the moon before you've even left the ground. Understanding that marketing and advertising is worth your attention but it is not the "end all be all." Many restaurants have built their large numbers of customers through word-of-mouth to create a strong cult following in their local or neighboring cities. It's what's on the inside that counts. Food quality and service are two of the most criticized elements of every restaurant. Fine tuning these two parts of your restaurant will never be seen as wasted time. Set short-term goals that are focused on trying new cuisines and the level of customer service that you feel fit your restaurant should be a priority. Since you know how you want your restaurant to look, than set up small goals that are focused on proper training of employees and increasing the quality of your menu. Long-term goals will once again go hand in hand with the short handed goals presented above. You may want to set up a yearly goal to have created a full proof template to hire, train, and manage employees. These parts could be completed in quarterly segments than culminate at the end of the year. The same could be said for the quality of your products. You may also have a goal to move in a more organic direction by slowly phasing out processed ingredients over the course the year. Setting up these longer goals to create stronger customer service or to completely change the palate of your restaurant's cuisine are goals on the horizon that can be achieved throw proper structure and completion of shortchanged term goals. Your restaurant's menu quality and customer service will either grow or cripple your restaurant. There is a certain synergy between the core of your restaurant and how it affects your finances and marketing goals. Simply put, if your dining experience is on point, the sales will start to come in and the word of mouth marketing will start to spread like wildfire. Restaurants are businesses that provide a service. A service of providing a dining experience where the environment, customer service, and of course the cuisine, are all inclusive. By creating long term and short term goals that revolve around the core principles of your restaurant, you will start to take the incremental steps to grow your restaurant over the coming years.